First things first, for those of you who do not know who Nykhor is, she is a successful South Sudanese model who in recent times has made quite a name for herself in the fashion industry. I first came across her in a magazine a few weeks ago and was taken aback by her beauty! Since then I have followed her and her career avidly (kinda). 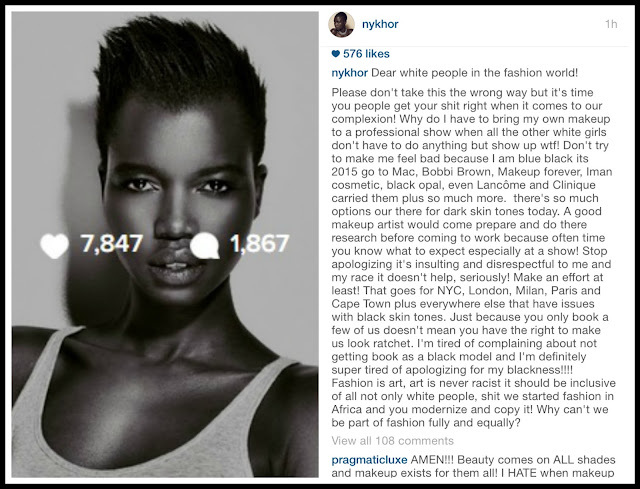 So Nykhor accused the fashion world of being racist... Nothing new there! 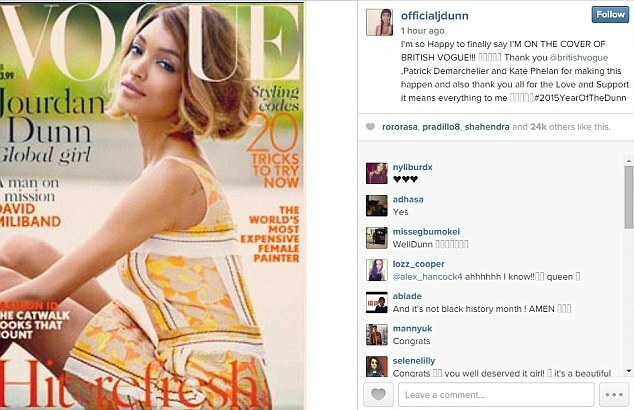 Naomi Campbell has made the same accusations and even more recently fashion's recent hot young 'black' thing Jourdan Dunn has levelled similar accusations. Even here at on BlackCleopatra we have spoken to a few models who have made the same accusations (read my man Wilnor Tereau's interview here). Yes, the fashion world is racist! But we all knew that already! Don't get me wrong, I was irritated when I read about the indignity that Nykhor and other black models have experienced in the western fashion industry. I mean at the end of the day, if you have hired a black model, then cater for his or her beauty requirements. Come on? You don't invite a vegetarian to dinner and only serve steak!! However, Nykhor's letter raises a separate but related question for me. Basically, there is a part of me that wonders why black models, being aware of the racism that exists in the western fashion industry, then accept to be part of a system that for the most part clearly doesn't value or see black beauty? I mean, if a system is designed to exclude you (intentionally or not) then why be part of that system.... wouldn't it be better to be part of alternative inclusive system or simply create your own?! HAHAHA... NO THIS IS NOT ME!!! I WISH!! I can't wear Levi jeans.... they are not made for women with my dimensions... so instead I just wear brands that are made for women with a similar shape to mine. Funny enough, as a direct result of the problems that I have experienced finding bottoms (jeans/skirts etc) that fit around both my small waist and wider hips I have always wanted to create my own (brand) of clothing (watch this space *wink*). For me, that is the answer. So in terms of fashion, perhaps we as a community need to patronise black designers more, so that they can afford to hire and pay black models the kind of money that the fashion industry is known to pay its top models. Now, I can imagine that some people might be thinking... Anthonia, you dont seem to understand the implications of your statement! If black people didn't fight for inclusion in the West, would we ever have the right to vote, study in historically white schools/universities, eat in white restaurants, play in sports in historically all white sports clubs etc. Yes! While that is true and I defend this type of inclusion... when it comes to an individuals creativity, can you force yourself on it? Let me explain... In her open letter, Nykhor says 'Fashion is art .... why can't we be part of fashion fully and equally?' Personally, I don't agree with this particular statement. Of course we can be part of fashion fully and equally. But fully how and equal to who? Go to African Fashion Week and see fashion. Attend a 'Top Model of Colour' event and see fashion. Must we fully participate in fashion that was not necessarily created with us in mind? Must black models have the seal of approval, and acceptance of designers and publications that are created for and by white people, in order to feel successful? For me, art is a form of self- expression and it is unique to the artist and his or her vision. If you as a male Italian (for example) designer appreciate the female form in a specific way e.g. tall, white, thin, and blonde... then who am I to tell you that you must include beautiful black me in your vision.... and if I did and you obliged, would that simply be a case of filling a quota in order to be pc? That is not art... that is politics. There is a saying that goes, 'beauty is in the eye of the beholder.' If a designer hires a black model, of course you must look after her and cater to her needs as a model. However, if a designer has a particular ideal of beauty, that does not include black beauty, then so be it. Perhaps, like latina and Asian models, our beautiful black models should work for those in the industry who have a wider more inclusive perception of beauty, or better still, our more established black models should do more to promote and support designers (black and white) that make fashion with an appreciation of our aesthetic and beauty.